Crab Claws & Cocaine: New Website! 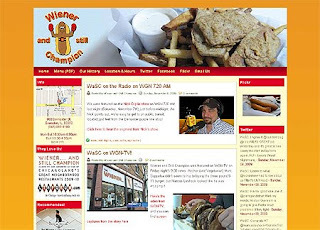 Yesterday I set up a website for my favorite hot dog stand, the Wiener and Still Champion in Evanston. Why do people charge so much for websites? I just don't see the point, unless there's some big, significant value being added over what you can do on your own, with a few hours of elbow grease. The site is hosted (free) with Blogger. I think it cost, in total, $6, for the first year of the domain registration. I ended up starting with this "Natural Health" Blogger template -- which I think is pretty funny considering it was going to be for a hot dog stand -- and tweaked it until I ended up with the yellow, orange and red thing you see before you today. This is a great way to utilize Blogger. If they're gonna give free food to anybody who makes 'em a webpage, I predict that, by Christmas, they will have twelve thousand webpages. I've booked plane tickets just for the dipping dogs and fried pickle chips. Al, would you be interested in redesigning a blogger site for me? Please email me with the details.